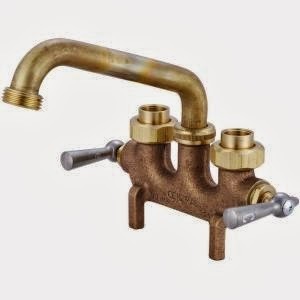 This rough brass faucet available via Home Depot is technically for a laundry sink but, am I crazy, or is it really good-looking? The scale might be a little small for a kitchen, but I would love this at a kitchen sink. Or maybe if you have a very cool bathroom this could work there? I love the tri-tone metals and the brassy-ness without feeling prissy. I guess it's industrial but I see it working in non-industrial spaces. And it's only 47 bones, so that's good too. Am I wrong? Do you agree? You are not wrong. That faucet is pretty awesome! Good find! It looks great. I love the vintage look of this faucet. But I guess you can do some cleaning for it to look better.